For what's likely the first time in history, the Army's 82nd Airborne Division is having Marine armored vehicles modified for airdrops as the paratroopers consider adding the vehicle to their Global Response Force toolkit. Last year and earlier this year, soldiers with the 82nd Airborne's 5th Squadron, 73rd Cavalry Regiment conducted simulator training with Marines at Camp Lejeune, North Carolina, hands-on driver training at Camp Pendleton, California, and maintenance training at Fort Lee, Virginia, said Capt. John Moore, a spokesman for the division's 3rd Brigade Combat Team. 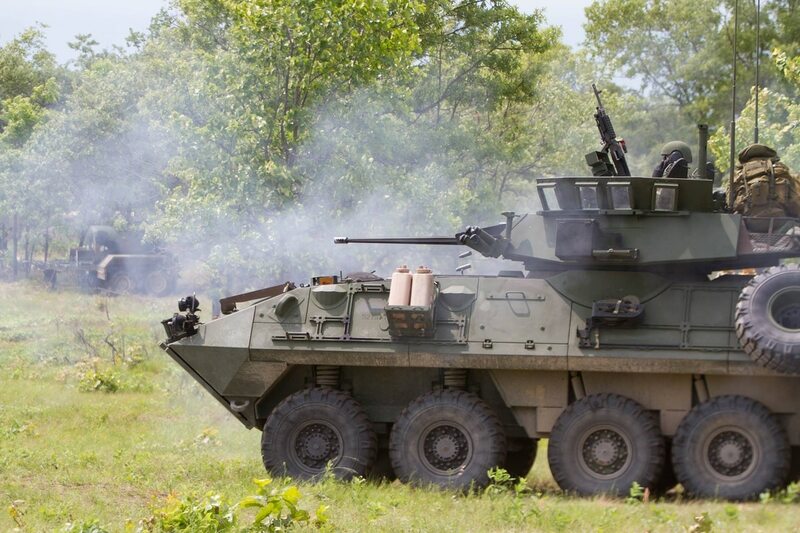 The paratroopers like the Light Armored Vehicle 25 for its lighter weight — compared to the Army's Strykers — and superior firepower as compared to what they have on hand at the division, Moore said. He declined to comment on the number of vehicles or airdrop testing but did say that the airdrop ability would be a "significant capability increase." The 82nd is part of the Global Response Force, with units ready to deploy to contingencies around the world on short notice. Under the mission, a battalion-sized element must be able to deploy within 18 hours, with others following soon after. The LAV is an eight-wheeled vehicle that weighs 31,000 to 38,000 pounds, depending on the variant. The models being tested by the 82nd Airborne have a 25 mm gun. The vehicles also use a three-person crew and can carry an additional six troops, according to General Dynamics Land Systems data. The Marines have sent four LAVs for testing and training by soldiers at Fort Bragg, North Carolina, said John Myers, the deputy program manager for the Marines' LAVs. Three other LAVs are at General Dynamics, the private company that produces the LAV and Stryker, where they are being modified for air drops, he said. General Dynamics Land Systems has already delivered one of the modified LAVs and expects to have the other LAVs ready in the next few months for a scheduled air drop, likely at Fort Bragg, in November, said Michael Peck, director of the company's Enterprise Business Development. This is the first time Peck knew of, he said, that any military client requested the LAV be used in an airdrop. But the company did its own successful airdrop tests of both the LAV and the Stryker in the early 2000s. No clients had made requests for the modifications until now, Peck said. Most of their foreign nation clients use the LAV variants for homeland defense and don't have a need for airborne operations. Peck said that the modifications require chassis work that involves parachute rigging attachments. The work takes about one month per vehicle. He said that four LAVs or three Strykers, depending on the model, could fit into a C-17. Interestingly, the LAV was originally going to be provided for both the Army and Marines when the Department of Defense began exploring the vehicle as an option. However, the Army opted out of the LAVs at the time. The Army has expressed interest in taking up to 60 LAV-25s, contingent upon test results, said Barb Hamby, spokeswoman for Marine Corps Systems Command in Quantico, Virginia.